Floating above Shibuya, with the Yamanote Line trains rocketing by, is Miyashita Park, its carvalicious bowls, ledges, rails, ramps and quarter pipes a skater’s dream. Except for…The Rules. Drinking for enjoyment rather than rehydration: prohibited! Light up a smoke? Tanuki raccoon-dogs will carry you off to be executed by the death of a thousand cuts! Wax a ledge? Not unless you want to be fed to the sea monkeys. Still, it’s a two minute walk from Shibuya Station, it only costs a couple hundred yen to skate, and it’s never crowded, so giving up a little stark-nakedness might just be worth it. Those trees are in surprisingly good shape. Are the skateboarders restrained enough to leave them alone? Hmm, good question. 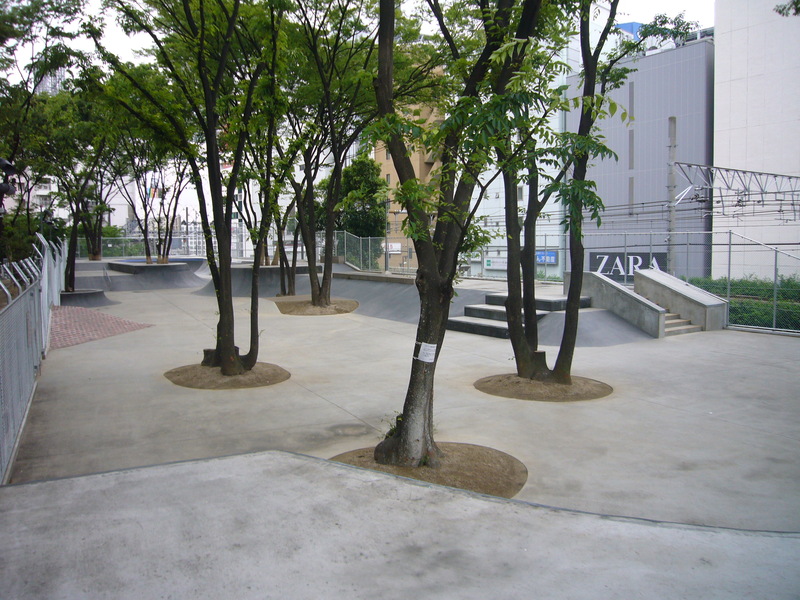 I don’t think the skaters are more restrained here than elsewhere, but this skate park is pretty well-designed – the dirt moats around the trees keep skaters from bashing into them by accident. They must get hit by rocketing runaway boards occasionally, though, and since this park is pretty new, I bet the trees might have more battle damage in a year or two. Your blog is awesome. I will be traveling to Asia for the first time this May. I would love to see your dad’s work shown here in Tokyo! It would be hugely popular, I think. Of course, you’d have to come for an exploratory trip to set everything up, checking out important support services such as all-night sushi and the prison hospital theme bar. Mi casa is su casa, if I’m still here. Sounds amazing. I am going to get the ball rolling with my dad. I will actually be the first family member to visit Asia. Been so busy with school/work haven’t had time to work on my blog but check out my latest post of delicious avocados! I can’t believe you’re even TRYING to read the Uni guide! I just spent half an hour trying to decipher the kanji on a sign I saw today, and it wasn’t even keigo!